Title: 03/17/1986 - Application of the Hazard Communication Standard to lift trucks. Rollins Burdick Hunter of Oregon, Inc. Thank you for your letter dated November 11, 1985, addressed to Mr. Carl Halgren, in regard to the Hazard Communication Standard. Please accept my apology for the delay in response. The overwhelming number of letters and telephone calls regarding the Hazard Communication Standard has caused unavoidable delays in responding to the public's concerns. OSHA considers lift trucks to be machines and not containers. Containers are required to be labeled according to the standard. Labeling vehicle components seems to be impractical and would be cumbersome. Material safety data sheets do not have to be provided for lift trucks. However, material safety data sheets are required for the gasoline and other fuels used by the lift trucks. Employees should be aware of the potential for exposure to carbon monoxide and associated physical hazards of petroleum fuel products such as fire and explosion. Labeling of vehicle components is not necessary. Lift trucks do not meet the current definition of an "article" because of potential exposures to carbon monoxide and physical hazards of petroleum fuel products. The "article" definition was one of the issues upon which OSHA requested comment in the November 27, 1985, publication of the Federal Register. Comments were accepted until February 25, 1986. If we can be of further assistance please contact our Office of Health Compliance Assistance at (202) 523-8036. 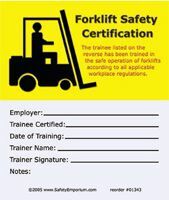 Based on a December 13, 1985, telephone conversation with Joseph Hopkins of your office, I am forwarding a request for an interpretation regarding lift trucks and the hazard communication standard. The requester, Mr. Kevin C. Donaghue, has been notified that his questions have been referred to your office and that a response will be forthcoming. I would appreciate a copy of your response. Does Hyster Company have to provide Material Safety Data Sheets (MSDS) for lift trucks (by-product of combustion-carbon monoxide)? Does Hyster Company have to label all radiators (antifreeze), brake lines (brake fluid), gasoline, propane, diesel tanks (fuel), crank case (various oils), etc.? Are they exempt from having to comply with items one and two because lift trucks are considered articles? I appreciate you considering these questions and am looking forward to your reply.